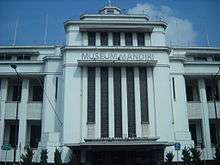 Museum Mandiri, the former building of Nederlandsche Handel-Maatschappij that was nationalized after the independence period. 1951: Bank Industri Negara (BIN) was established to finance priority sectors, such as plantations, industry and mining. 1959: The Indonesia government nationalized Nationale Handelsbank’s operations in Indonesia and from them created Bank Umum Negara. 1960: The Indonesia government nationalized the Indonesian operations of two more Dutch banks. It used Nederlandsche Handel-Maatschappij’s operations to create Bank Ekspor Impor Indonesia. Escomptobank became Bank Dagang Negara. The government also established the state-owned Bank Pembangunan Indonesia (Bapindo) and merged BIN into it. Bapindo specialized in medium and long-term financing of manufacturing, tourism and transportation. 1964: The Indonesia government nationalized Chartered Bank’s operations in Indonesia and merged them into Bank Umum Negara. Chartered Bank, a British overseas bank, had first entered Indonesia in 1863 when it opened an agency in Batavia. 1965: The Indonesia government brought Bank Umum Negara into the Bank Negara Indonesia group, renaming it Bank Negara Indonesia Unit IV (BNI IV). Similarly, Bank Ekspor Impor Indonesia became Bank Negara Indonesia Unit II (BNI II). 1968: The Indonesian government again reorganized some banks. BNI IV became an independent bank with the name Bank Bumi Daya. The government split BNI II into two parts, with the BNI Unit II Export-Import Division becoming BankExim, which specialized in trade finance. 1986: Bapindo expanded into general commercial banking. 1999: The government merged Bank Bumi Daya, Bank Dagang Negara, Bank Ekspor Impor Indonesia and Bank Pembangunan Indonesia to create Bank Mandiri. 2004: The bank opened a branch in Dili (East Timor), and a representative office in Shanghai (China). Bank Mandiri (Europe) Limited, located in London, UK. Subsidiary of PT Bank Mandiri (Persero) Tbk. Based on mystery shopper method done by surveyor, in 2011 Bank Mandiri got average value 91.23 percent, a first time for a bank got more than 90 percent over 15 years survey. Bank Mandiri got Service Excellence Award for 4 times consecutives and got The Most Consistent Bank for 2 times. 1 2 Fundamental Keuangan, data diakses 06 Januari 2011. ↑ "Bank Mandiri Head Office Address." Bank Mandiri. Retrieved on September 30, 2012. ↑ "Indonesia-Investments.com:Bank Mandiri company profile". March 25, 2014.